It’s finally here! Another epic adventure that felt like birthing a child. Not that I’d know, but, it’s what I imagine! Recently I participated in a 30 day coloring challenge…and I challenged myself to color in my Bible daily. Or should I say Bibles – I knew at some point I’d do some testing of mediums and books, so this was an effort to dive deep and just get ‘er underway! I had been journaling occasionally for almost a year, but hadn’t come to any “conclusions” about much of anything – and the questions have been coming at an increased pace. So I knuckled down and began the hard work of testing through things as best I could while keeping life afloat! I developed a beautiful devotional process through that month-long challenge, and am happy to say – the habit was fully developed! I may not be journaling every day, but the daily habits I began have continued, and what a blessing! In today’s video I’m just rolling through stills as I share my three biggest learnings from this adventure. And I know there could be some disappointment that you aren’t seeing the backs of pages; it’s odd that as soon as anyone looks at my Bible pages, they flip to the back before they can even handle looking at the front! (Recommendation: please don’t do this to others, it feels really weird that people care more about the back side! Just ooh and aah and casually see the back later.) Watch the video below or click HERE to see it in HD on YouTube. Then come on back here for some more info. It’s all about time with God. If you’re just rushing to get a page done, you’re missing out on the BEST part of this process: time with God! It’s worth it to take the time to read, pray, meditate – and then create. It’s about being authentically you. Go on a Pinterest and Instagram fast if you find you feel inadequate, or discover you’re just copying what others create. This process is about you hearing from God and creating from your heart – not about being Pinterest-worthy or comparing yourself with ANYone else. It’s not about the art. Weird, right? But you don’t need to have #allthethings. You don’t have to buy all the supplies. For a long time I let the fear of the cost stop me – I worried I had to buy gessos and research how to use them, and buy all the kits, and get the right paints – and no, you start with what you have. A pack of pencils is PERFECT. Dollar store pencils. Yep, I said it. Dollar store. Way more information. Did I say way more? A lot of you have been anxiously awaiting my verdicts on mediums, using them in ways that don’t bleed through, etc. And rather than create a five hour YouTube video, I’ve set up TWO ways to deliver a ton more information to you. For one, I decided to make it a class. An online class. And it’s on sale right now, too! Bible Journaling 101 is self paced – which means you can buy the class, and you’ll get the email with a link and your password…and you can dive through all 10 lessons if you want. Or save them. Savor them. Whatever works for you! I know some will want to “survey” all the mediums before deciding what they want to start with or try, so I made it that way especially for that reason. My favorite part of the class – and I hope it’ll be yours too – is the Process lesson. I went into pretty good depth on how I heard God through my devotional time and how I would get images from Him by the time I journaled in the evening. In my in-person classes this year, I’ll be going into even more depth with students about that, but for now until we find out if I’m coming to a city near you, you can get the class HERE. And number two, I’ve created THIS master page to house all my Bible Journaling info. 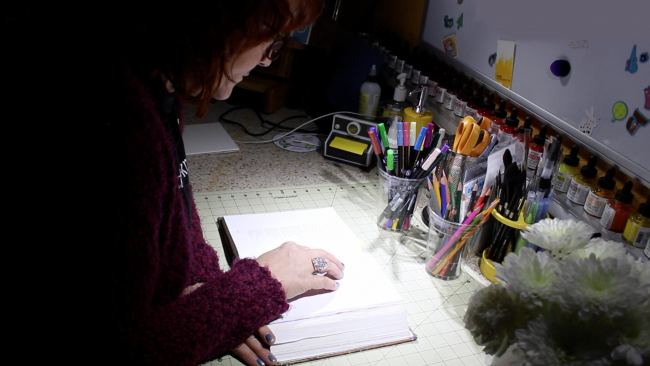 FAQ, Bible links, Products I use and a good bit of info about them, and a gallery of the pages seen in the above video (and I’ll add to it over time). A lot of that information is pulled from the testing in the class – so technically you can get the “verdicts” from the list, but I know many of you will want to see it yourself. My desire is to see more people getting into a deeper relationship with the Lord through creativity. I pray this helps you to get to know your King better. If that happens while you’re doing the devotional part of the process and you never get to the art part, that’s totally fine with me. Mission accomplished! Whether you’re one of those just looking in over the fence, afraid to start, or if you’re an experienced Bible journalist who just wants to explore more….I pray this information takes you deeper with God. This is all about your relationship with Him. If you’re just making art and not getting to know Jesus better….then you’re just making art. Don’t miss the best blessing! I’m going to be listing supplies for Bible journaling over on the Bible Journaling page. That way I can update in just one place. Click HERE to go see all that information. Thanks! Bless you for this post. I have lead Bible studies for years and I can never stress enough that you have to make yourself available for the Holy Spirit to guide you. He will not force you. I also appreciate that you said that you can use supplies you already have or use very inexpensive ones. I’m alarmed that so many people are getting into financial trouble because they think they need everything they see demoed. This hobby is supposed to help us de-stress, not add more because of debt. Thanks for sharing these 3 encouraging tips! Sandy, I certainly appreciate the way you expressed the true reason for bible journaling. I, too, was so happy to see more interest in God’s Word but also hoped it would not be another “art adventure”a but another step toward our steps to that ultimate relationship. I am happy to know that you are having a class and I like to knows the info concerning supplies and I pray for the end resuslt of spending time with “HiM”. Blessings! I am really looking forward to taking the class! Thank you for all of your tips and help! You are wonderful. What a wonderful explanation of purpose and process… But mostly emphasis and conversation. Can’t wait for the class. This is an awesome post – thank you! 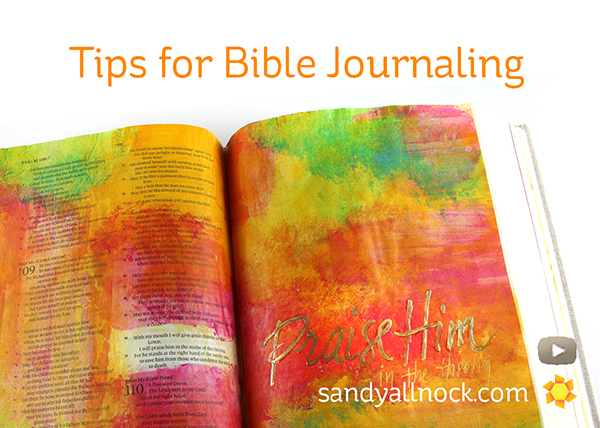 Thank you, Sandy, for taking the time to put together information on your blog and in a video, as well as developing a class, for Bible journaling. I love what you had to say about “being authentically you”. I’m excited to see what will emerge as “my style” as a I learn to spend creative time seeking God. I firmly believe that God puts us where we need to be, when we need to be there. Also, I have been experiencing a spiritual desert for a very, very long time. I think I am being nudged through you, Sandy. Thank you. I have always cringed when I saw people writing in their bibles but you have shown me that this is another beautiful way to connect with God. Thank you for opening my eyes and thank you for sharing your inspiration. I have been anxiously waiting for this class to start! I am soooooo excited to journal creatively my favorite Bible verses and the ones God shows me in the future! Thanks, Sandy!!! Great advice. TFS and God Bless. This is a wonderful post, in so many ways. It looks like you’ve put a lot of time into this. Thanks so much Sandy. I’ll be passing the link to online class to a couple of friends of mine who have expressed interest in bible journaling. Thanks for inspiring us all to get a little closer to God especially during this time of the year.